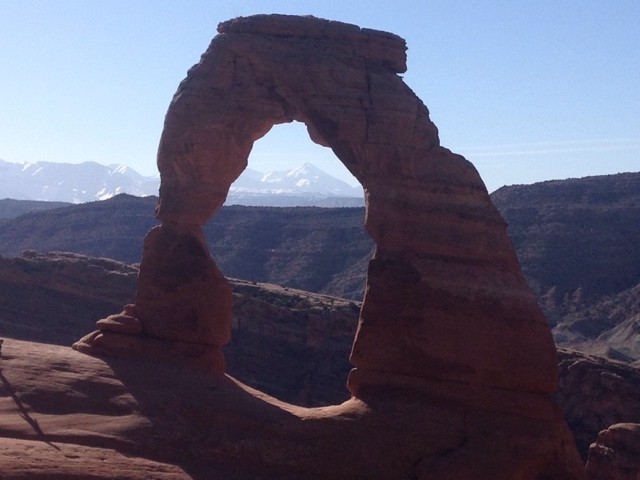 My favorite National Park is Arches NP in Moab, UT. It's Thursday, 3/17/16 (Day 74) and arrived last night. An early start into the park found no one attending the toll booth just after 8:00, since I get in free with my senior pass it didn't bother me to skip the Visitors Center and head right in. You can tell by the angle of the Delicate Arch shadow that it was still early in the morning although a large school group was just coming down as I was making my way up. I came to Arches NP last year about this time of year and did this same hike. I don't do retakes unless I really like what I had done before. This is my recommended first stop at Arches NP as this is one of the more popular stops and hikes. You may notice snow on the mountains through the arch. I don't remember snow on those mountains last year. My have to check last year's post. 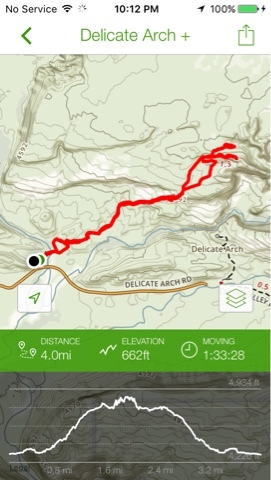 Although my app AllTrails lists this hike as easy, I would list it as moderate for the elevation change alone (662 ft). The trail brings you to the top rim of what I call a punch bowl with the arch on the other side of the rim. It is not in my mind to venture over to the arch like others do walking on the curved rim of the bowl. I didn't walk it last year, and nor did I this year. But many others do for a photo opportunity. 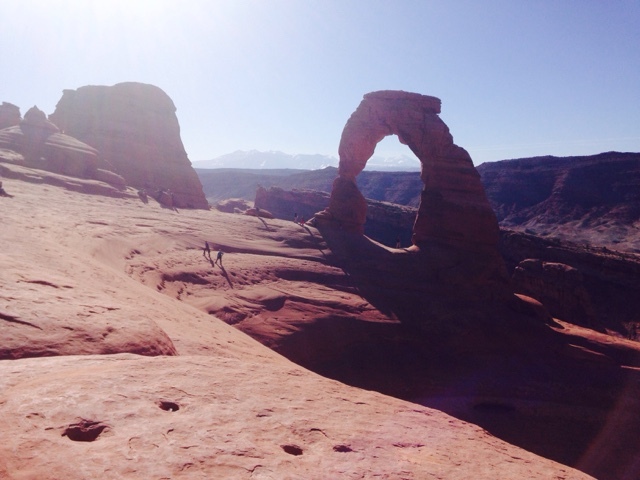 While visiting Delicate Arch there were many people coming and going and a number of groups of kids on school break. One such group was six kids with one male chaperone. The kids were bouncing around on a group of rocks on the side of rim where I sat. The kids were making me nurvous as was the chaperone. He would turn his back and another kid would be jumping on and off rocks on the bowl rim, even with his persistence to have them stop. He says loudly "You don't know how nurvous you are making me right now!" Then he yells louder and they stop and he collects them around him and they march back down the trail. Not a photo was taken by any of them. No memories to share with parents, and they deserved it. The chaperone did the right thing. On my way down I met a woman hugging the cliff wall with both hands shuffling her feet slowly to move down the trail. The mountainside was carved out for the trail, wide enough for two with a 100 foot drop if you make a mistake. I don't like heights and passing people while I'm on the outside bothers me. I started to talk to her to help calm her nerves. After a few of my sentences of reassurance she responded. She had seen the kids that were out of control and left as soon as she reached the top as the only real safe haven on the rim was we're the rocks were, and I was sitting. The unruly kids occupied this space. She turned immediately and started back down very scared for her and others safety. She was about 40 and worked in a hospital and was an EMT, as I used to be. I focused our conversation on our work as EMT's. She calmed as she made her way down and at the bottom of the bowel said our goodbyes. I get bothered by others that take undue risk as I have seen the trauma that results from injuries of this risk. The woman EMT also expressed her anxiety was in part thinking about what she has seen from risky behavior, but her feet was so much more magnified than mine. I saved the hike me to my AllTrails app and with an extra side trip to another nearby arch it was a good hike at 4 miles. 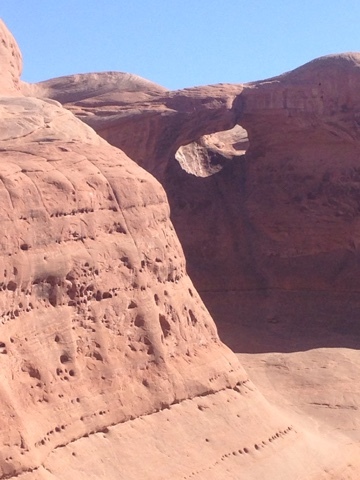 This is the other arch that is further out from the Delicate Arch that I hiked over to check out. To get to Delicate Arch you need to climb the ridge you see just below this other arch. (Look for the people - up is to the left). You pass this arch just before you arrive at Delicate Arch. You need to look up or you will miss it! This is the trail that is only 2 people wide and with the number of travelers you end up passing people on the trail. There is no railing to save you from falling. 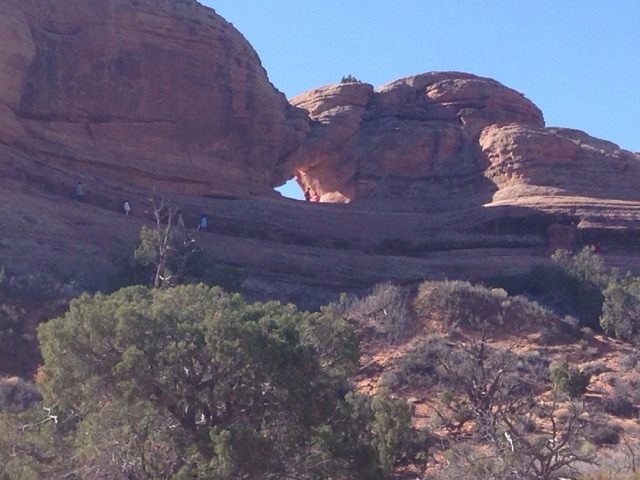 If you look closely there are more adventurous people standing in this arch. 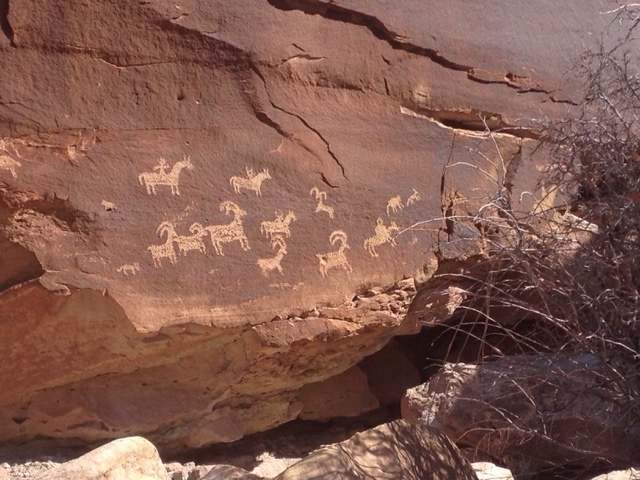 At the bottom near the parking lot are some well preserved petroglyphs. Stop by to see them on the side loop trail. It was a busy day at Arches NP so I have broken my blog posts into a number of parts to cover various arches I toured. Denise has told us all about the people not wearing proper footwear. Yikes!! But your pictures are beautiful.